Emmy award-winning filmmaker Michael King spoke at Augsburg recently about his newest project, The Rescuers. The film honors the work of 13 diplomats—Muslim, Christian, Buddhist, and Sikh—who risked their lives to save others during the Holocaust. King became interested in the story of these diplomats after seeing a photo exhibit about their lives. He worked with noted British historian Sir Martin Gilbert, who had just completed a book about common people who saved Jews during the Holocaust and with Stephanie Nyombayire, a Rwandan anti-genocide who lost 100 members of her family to genocide. His research led King to descendants of the diplomats and to survivors of the ordeal as he uncovered stories largely unknown before this time. 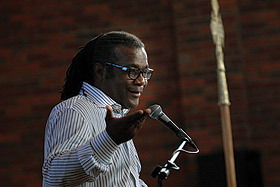 In addition to his chapel talk, King screened his 2008 film Rapping with Shakespeare and spoke with Augsburg’s jazz band members about the role of music in film. King was invited to Augsburg by assistant music professor Ned Kantar; at a recent ceremony, Kantar’s local synagogue honored King for his work on the film. Go to the documentary website to learn more about King and The Rescuers, to find opportunities to view the film, and to meet the diplomats featured.